I probably should have posted this recipe years ago but I'm finally getting around to it today! 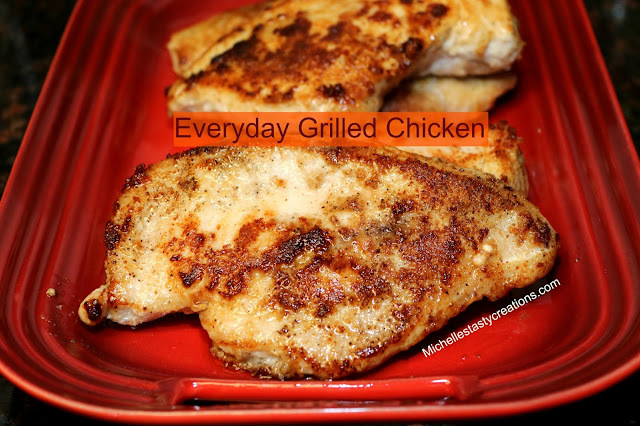 This is my "go to" recipe for grilled chicken that I use in a variety of recipes and it is a family favorite, mine especially, because of how quick and tasty it is. My son got me making this for his wraps after tasting it on my salad one day. It is also the perfect accompaniment to my Rice and Vermicelli and a side salad for a quick dinner any night of the week. salt, pepper, garlic, and onion both sides of the chicken breasts and set aside. Heat oil and butter in a large skillet and add the chicken. Cook about 5 minutes per side. When it is nice and crispy brown and 165 degrees internal temperature it can be removed to a plate. Serve on a salad, in a wrap, or as the main course for dinner. Any way you slice it it is delicious!